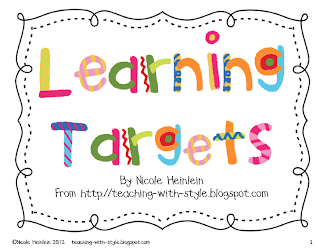 Primary Possibilities: Learning Targets...and a Giveaway/Favor! Stephanie found this great free download awhile ago and has it up in her classroom with her daily learning objectives. It is great for pocket charts! You put it with your daily learning objectives, standards for the day etc. It's made by Nicole Heinlein over at Teaching With Style. Speaking of "Target" they are having a "Give With Target" Promotion. I know almost everyone who reads this has their own school to vote for, but it is worth a try to get a few votes! It only takes two clicks to vote so please click below and vote for our school! Here's the great part, we are going to giveaway a product from each of our stores to a lucky winner. You get to choose the products you want! All you have to do to enter is vote and/or blog about this post to get us some votes for our school. So enter away down below!